Electronic potting and encapsulation involve filling or encapsulating an electronic assembly with a compound to protect the components from shock and vibration, corrosion, and contaminants such as dust, moisture and chemicals. Potting and encapsulation deliver a thicker and more robust solution versus conformal coating to protect your electronic assemblies from harsher environments, tin whiskers, and to keep them functioning properly for longer lengths of time. 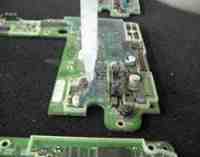 The potting electronics process also protects components from security threats, such as tampering or reverse engineering. Potting and encapsulation are used to protect a variety of components including PCBs, electrical devices, and electronics. Contact us today to discuss the benefits of potting PCB. Since potting and encapsulation can enclose an entire electronic assembly, the procedure can be used to make the circuit FIPS compliant. Electronic encapsulation and potting will protect the assembly from unauthorized entry, modification, and reverse engineering, and any attempt to remove the protective material will destroy the circuit in the process. Plasma Ruggedized Solutions is one of few companies that offer FIPS services, for a variety of applications. Our continuing innovations help us stay at the forefront of this growing sector of the industry. We are your source for potting and encapsulation services and can handle any quantity, from first articles to large production quantities. Our experts will help you select the ideal coating material for your electronic encapsulation and potting requirements to ensure superior performance and long life. Every assembly we work with is inspected and, if necessary, cleaned before coating to guarantee uniform adhesion. 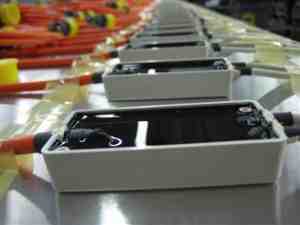 And we rigorously test each assembly at various stages of the process to verify proper functionality. In addition to preventing tampering, potting and encapsulation and epoxy coatings create a barrier against moisture, dust, fungus, and corrosion. These processes also enhance circuit reliability by eliminating leakage from high voltage circuits and protecting against voltage arcs and short circuits by preventing the formation of tin whiskers. We offer a variety of available materials for your electronic encapsulation and potting requirements including epoxy coatings, silicone coatings, urethane coatings, and, to a lesser extent, acrylic coatings. Epoxy coatings are ideal for harsh environments and physical security protection and are tailored to the specific needs of your application, including high voltage or thermal concerns. Silicone potting and silicone encapsulation offer superior protection against moisture exposure and use a more forgiving material which protects assemblies from stress and allows for movement. Urethane coatings are also useful in extreme environmental conditions, but aren’t as hard and put less physical stress on the protected assemblies. Metal microfilaments known as tin whiskers can form on printed circuit boards and other components over time, leading to shorts, metal vapor arcs, and other issues that affect product functionality. Encapsulating/potting PCBs with epoxy coating or silicone coating helps control the growth of tin whiskers by providing a protective barrier against environmental factors that can lead to whisker growth. Any tin whiskers that do grow are contained within the coating, and therefore unable to cause damage to the PCB or attached components. Encapsulating and potting PCB requires a high level of expertise to ensure consistent and repeatable results. Special attention is required to ensure the resin is applied at the correct temperature, and that the correct resin-to-hardener ratio is used to achieve the desired results. Coatings must also be properly mixed and dispensed to produce a smooth, even coating. Our facility employs a number of unique processes for electronic encapsulation and potting, and many of our techniques have now become standards throughout the industry. 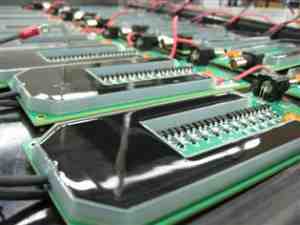 Our fence & fill application creates a containment system directly on the circuit board assembly being coated to cover only specific areas of the PCB if a complete coating is not needed. This provides a high-quality, low-cost solution for our customers. We continually strive to remain on the cutting edge of potting and encapsulation technology and techniques and are constantly engineering and implementing new innovative methods to give our customers the finest service available. We design and create our own molding systems and fixtures in-house to offer high levels of adaptability for any customer requirements. Plasma Ruggedized Solutions is the industry leader in potting and encapsulation, working across numerous industries to provide solutions to a variety of applications. Request a quote today, or contact us to learn more about our FIPS compliant potting and encapsulation services.